← August’s Referee of the Month: Just David! It sounds interesting. It is interesting. But is it for you? The answer is simple: Of course it is. Roller derby is for everyone. Roller derby is incredibly unique because it does not require you to be the “right” type of person for the sport. Roller derby does not care about your age, your race, your sexual orientation, your body type, your education, or your profession. Roller derby only cares that you show up with the right attitude and the drive and determination to learn, improve, and grow. Currently, the youngest skater in our league is 19 and the oldest is 44. In addition to the 25 year age span, our league members come from all walks of life. Some of us are students, ranging from undergrad to Ph.D. Some of us are parents. Our league also includes a large array of professions, such as care-givers, college instructors, engineers, food service industry workers, nurses, and scientists. Still, you might think that you’re not quite cut out for roller derby. The bottom line is that you are absolutely cut out for roller derby, even if you don’t know how to skate. Believe it or not, most of the Red Stick Roller Derby league did not know how to skate when they started. We have a very dedicated fresh meat coach who will teach you everything you need to know about skating and an excellent group of trainers who will help you continue to learn after the fresh meat program has ended. “Fresh Meat” is a 3-month program where you will learn how to skate, stop, fall, and hit. You will also learn rules and strategy. At the end of the program, you will be tested on the skills you’ve learned to make sure you are safe to become a rostered skater. There has never been a better time to join the world of roller derby. 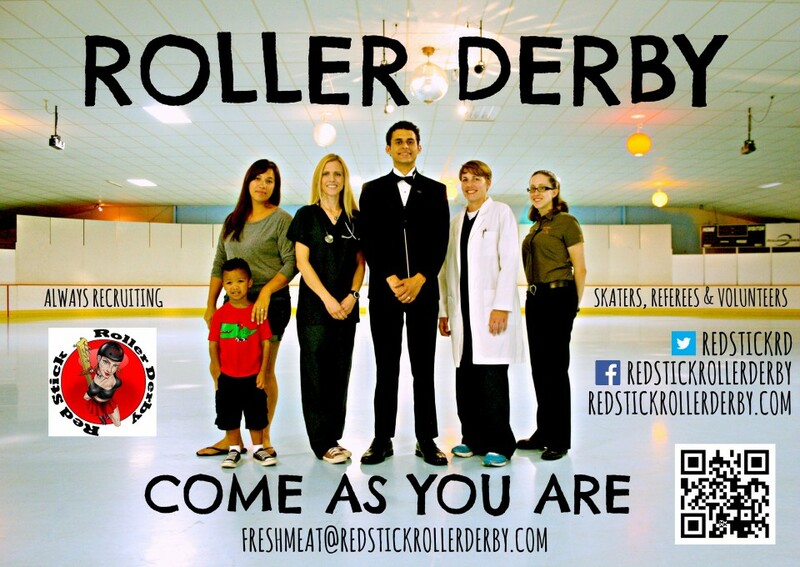 Not only is roller derby the fast growing sport in the world, but Red Stick Roller Derby is also constantly growing and becoming a greater force in the derby world. If you’re nervous about joining us, that’s understandable. Most of us were terrified the day we showed up for fresh meat try outs. Don’t worry though. The nervousness will subside and you will be happy you showed up. We’re looking for female skaters age 18 or older and female or male referees age 18 or older. We will teach you everything you need to know. Try outs are tonight (September 3rd) at 7:00 PM at Leo’s Rollerland (1717 N Airway Drive, Baton Rouge, LA 70815). Roller derby really is for everyone. We’d love the opportunity to prove that to you. So come as you are. We can’t wait to meet you tonight.